Robert Silman on "Being Heroic?" In a free public lecture sponsored by the Steel Institute of New York, Robert Silman, President Emeritus of the structural engineering firm he founded in 1966, Silman, will deliver a talk entitled "Being Heroic?" in the Rose Auditorium on April 4. He will use examples of steel structures from his firm’s work to illustrate the point that being “heroic” is not all that is required for excellent structural engineering. Attendance is worth 1.5 AIA/CES LU/HSW continuing education credits. Mr. Silman has directed all phases of the firm's operations including the supervision of design, production of contract documents, construction, contract negotiations and cost review. The firm divides its time evenly between projects of new construction, alteration, renovation and preservation with Mr. Silman contributing his knowledge in all structural materials—steel, concrete, timber, fabric, aluminum, plastic, carbon fiber and glass. In November 2015, Mr. Silman received the Louise du Pont Crowninshield Award from the National Trust for Historic Preservation. Recognizing decades of commitment to the Preservation of Historic Landmarks The Crowninshield award is the National Trust for Historic Preservation’s highest national recognition. Mr. Silman has particular expertise in historic preservation, as evidenced by his work on Carnegie Hall, Fallingwater and The Museum of Immigration at Ellis Island, and including knowledge of construction systems in the United States dating back to our earliest building types. On the basis of his outstanding professional qualifications, the Secretary of the Interior appointed Mr. Silman to the Advisory Board for the National Center for Preservation Technology and Training, for which he is past-Chairman, representing the fields of engineering and preservation education. Mr. Silman is also an international leader in the promotion of sustainable design or “green” building practices. As Founder of the Working Commission 7 on Sustainable Design for the International Association for Bridge and Structural Engineering, he chaired their annual symposium in Rio de Janeiro, devoted to issues of sustainability. In recognition of his dedication to excellence in structural engineering and his role as a mentor for young engineers IABSE awarded Mr. Silman the prestigious Anton Tedesco Medal in 2005. He currently is teaching at the Graduate School of Design at Harvard, having previously taught at Columbia and Yale. 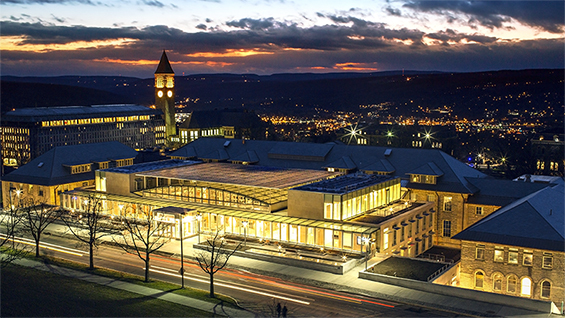 He is just completing his term as a member of Cornell University’s College of Architecture, Art and Planning Advisory Council. You may watch a recording of the lecture on The Irwin S. Chanin School of Architecture Vimeo Channel.